Calendula, used to sooth cuts and rashes and any kind of wound, is a homeopathic remedy that no first-aid kit should be without. 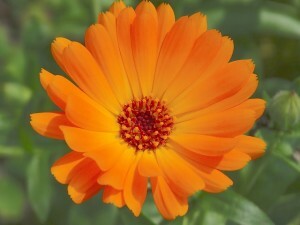 Calendula is made from the Garden marigold (Calendula officinalis). This flower has healing power that needs to be shouted from the rooftops. I’ve been using it at Save A Dog for a number of years and it works with amazing speed and efficiency. I use it in the gel form (made by Boiron) on female dogs who have recently been spayed to help to keep the spay incision closed and clean. Also, if a dog gets a cut, I immediately run for the Calendula. The only caution about Calendula is to avoid putting it on a dirty wound because it’s healing properties will close up an open wound. So if you have a wound that needs to drain, like a dog bite, do not use Calendula. It also comes on a little sugar pellet that you can pop in your mouth for generalized healing. For dogs, I like to mix it in water and then use it to rinse a dog’s mouth when they are recovering from dental surgery. Everything heals up so fast. Just drop a couple of the little pellets into 4 ounces of distilled or purified water, let it dissolve, then stir it briskly. Take a teaspoon and drop it onto the dog’s tongue or squirt it with a syringe all inside the dog’s mouth. True story: The other night I noticed that my Jack Russell was limping. I picked him up and noticed that his rear pad was swollen and had two bright red cuts on it. I immediately reached for the calendula gel and squeezed a generous amount on his pad while my husband held him. We kept him off the floor for about 30 minutes before letting him walk on his pad. (He enjoyed hanging out on the sofa with us). Within the hour he was putting weight on his foot and by the next morning his pad was back to its normal size with just the faint hint of a tiny bump remaining. Once again, Calendula saved me from an evening vet visit. I never cease to be amazed by this homeopathic remedy. I have been using Calendula salve for many, many years, as I lived in Brazil where Homeopathic treatment, doctors and pharmacies are plentiful. I use it for dry crustiness in my nose and dry lips in winter, for runny, sore nose from any kind of allergy, principally from airplane air, air conditioning and heating. Also, I always use Calendula on any cut or bruise I have. It is excellent treatment! wow, Learned something new,wonderful and natural! !